I never thought the day would come when I could snuggle into my big cozy bed, throw the covers over myself, and do a whole month’s worth of… yep… you guessed it, GROCERY SHOPPING! There was absolutely no hesitation when grocery pick-up became available to me! I jumped on that train in less than a heartbeat! I’m a mom of two young boys and a wife to a husband who works a lot of crazy hours. So, that leaves me to do most of the household chores. I can handle the dishes, the endless amounts of laundry, the mopping, and the constant picking up. I can handle the vacuuming and the dusting. I can even tackle the lawn in record time. But grocery shopping is the most dreaded chore of all. You can say I’m a little “type A” especially when it comes to grocery shopping. I still write lists in the order of where the items are located in the store, starting with the outside aisles and working my way in. I like things to be neat, organized, and smooth sailing. But add two boys (ages 5 and 3) to the mix and it is just a recipe for disaster! Might as well rip the list up in the car before entering the store. Because it’s guaranteed that I will forget at least 3 of those items! Hot mess mom coming through. My kids are (mostly) well behaved but there is just something about entering the market that turns them into complete monsters. I may have been a little naive when they were younger, thinking… “This will get easier the older they get.” Believing they would be able to walk nicely beside me while I calmly stroll the aisles. I imagined they would not hang off of the grocery cart like little monkeys, or running down aisles, or touching everything in their sight. Not whining and begging to buy everything with a sugar content higher than the temperature outside (ok, a little exaggeration, but really… they aren’t begging for that broccoli in the produce aisle). Nope. No such luck for me. Grocery shopping with two boys has become an Olympic sport for myself. I have come out of the market after an hour feeling like I just ran a marathon. Please tell me I’m not the only one who has felt this way? 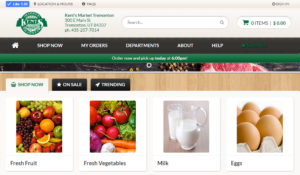 So, you can imagine my excitement when I heard you can actually order groceries online and pick them up at a time you reserve! This has been a huge life-saver! I can get my boys off to bed at night, sit in a quite home and add groceries to my cart with the click of a mouse. The process is so simple and very organized! Right up my ally!! I have had people ask me if I would trust some random person to pick out my meat and produce. My answer: absolutely! I like to shop LOCAL and most small markets offer a produce guarantee. So, that is just a no brainer! I have yet to receive a bad order of produce or meat! In fact, I would say they do a better job than myself, I mean… they are the experts, right? The best part of grocery pick-up is, well, the pick-up!! I have the option to go into the store or have my groceries delivered to my car. I like to save myself the car-seat shuffle (moms… you get me?) and have them brought out to me! I’m always greeted with warm and friendly customer service, which is always a plus! They place my groceries in my car and I’m off. You just can’t beat a 10-minute grocery trip! Am I right? What a pleasant experience! So, whether you are a mom or not I highly recommend giving it a try! 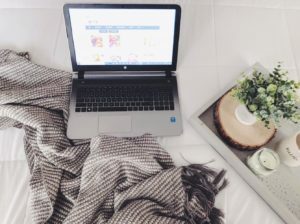 I think you will be surprised by how enjoyable and time efficient grocery shopping can actually be! 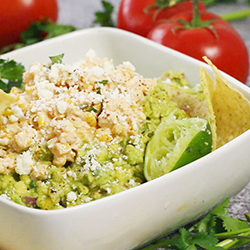 Are you ready for the best low-carb pasta dish? 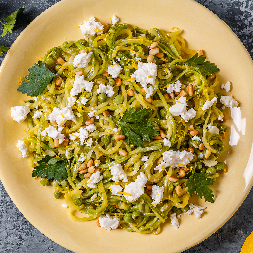 Enjoy this pine and feta zoodle dish. Melt butter in frying pan and add minced garlic. Stir until fragrant and slightly brown. Add Zoodles and toss in butter and garlic mixture. Let sit until warmed through. Plate and top with feta and pine nuts. 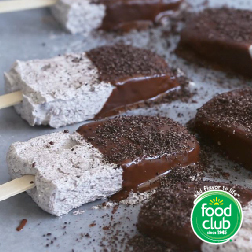 Make creamy popsicles with a chocolate coating and cookie crumble. 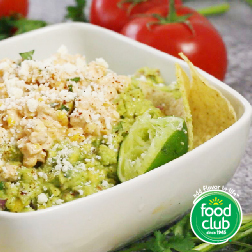 Try out this Food Club favorite! Blend cream cheese and honey into medium bowl. Set aside. In a small bowl, beat pint of whipping cream until soft peaks form. Add whip cream to cream cheese mixture and combine until smooth. Fold in crushed cookies. Fill 8 popsicle molds with mixture using piping bags. Freeze 4 hrs. 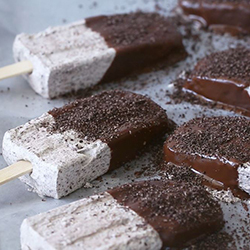 Dip frozen pops in melted chocolate and top with crushed cookies. 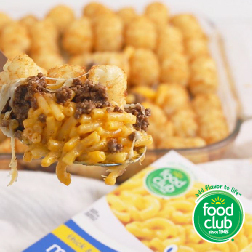 All the Food Club staple items come together in one tasty casserole. 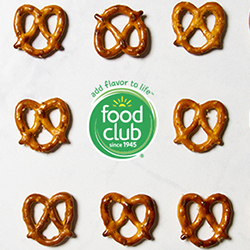 Try out this Food Club favorite. Preheat oven to 350° F. Cook macaroni & cheese according to package directions. Place completed macaroni & cheese in the bottom of a 9×9 glass pan. Top with cooked ground taco meat. Sprinkle shredded cheese all over. 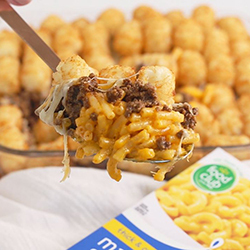 Top with tator tots to completely cover taco meat. Bake for 12-15 minutes. 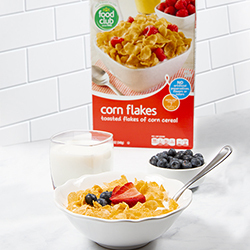 Transitioning to Food Club allows our store to have a better supply of products to meet your needs now and in the future. 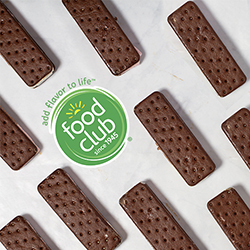 Food Club provides updated and more appealing packaging, affordable prices, uncompromising quality and a double-money back guarantee. 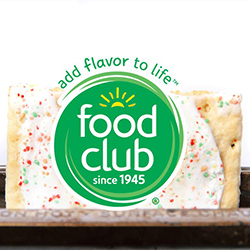 Plus, Food Club offers many new items unavailable previously. We’re excited about the update and look forward to hearing your feedback. Combined with other exclusive brands like Culinary Tours and Full Circle, our store is ready to deliver the items you want at prices that will make you smile.